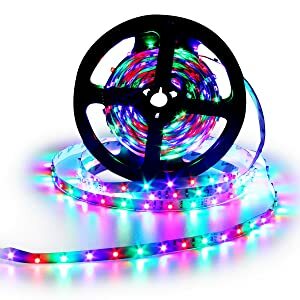 3528 SMD RGB 5M LED strip lights + Remote controller + 12V power supply,non-waterproof , high intensity and reliability, Long lifespan Every 3-LEDS cuttable without damaging the rest strips, according to your requirement Width: 0.8cm, Only Lit Red/Green/Blue,NO White lighting. 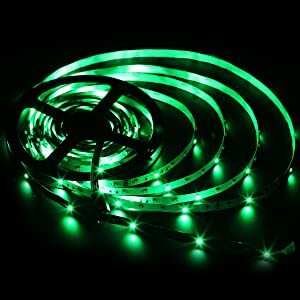 Completely smooth and even light spread, solving the uneven luminous problem with a chain of fluorescent tubes Low carbon, no radiation, no flicker, and no pollution to human and environment. Safe and stable. DIY Decoration, whatever and wherever you like! 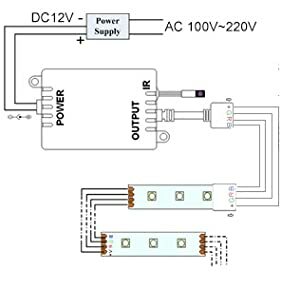 >>This LED light controller uses 12V input power and has a 4 contact plug for a RGB strips. >>When installing just line up the marked arrows. 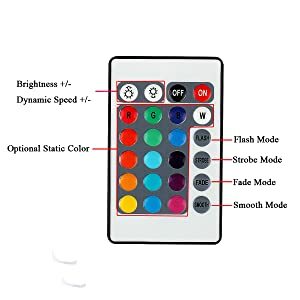 >>You can choose between many different solid colors, solid Red/Green/Blue, flashing, strobing, adjust brightness, and on/off all from the wireless remote. 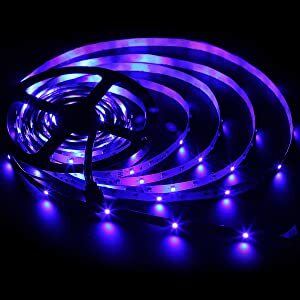 >>Simple to used 24-key IR RGB controller to control our RGB flexible LED strips. If you press the W key, the strip will emit mixed colors ( Red Green and Blue). 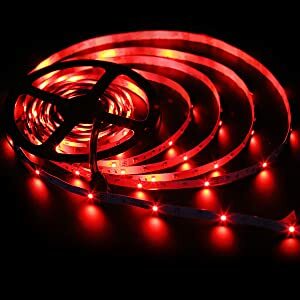 Why SMD 3528 LED strip can not emit White light? 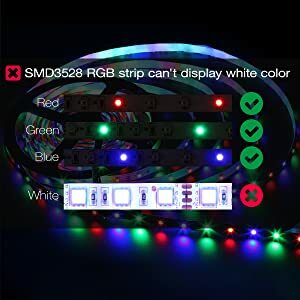 Because our this 300pcs SMD 3528 RGB leds are assembled with 100pcs Red leds+100pcs Blue leds +100pcs Green leds which it is different from 5050 RGB LEDs. 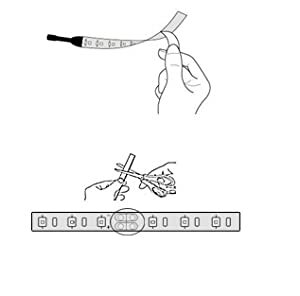 In other words, SMD3528 RGB leds strip has only 3 single colors (Red, Blue,Green). But you can choose mixed colors, and SMD 5050 can not do that.